We launched The Stephanies last month and promised to share half our profits for the month of November with First Book. November is done and gone (and with it all those great Movember mustaches!) so it’s time to tally our sales and make a donation. We sold a whopping 7 print copies and 8 digital copies, for a grand total of $30.38 in royalties. 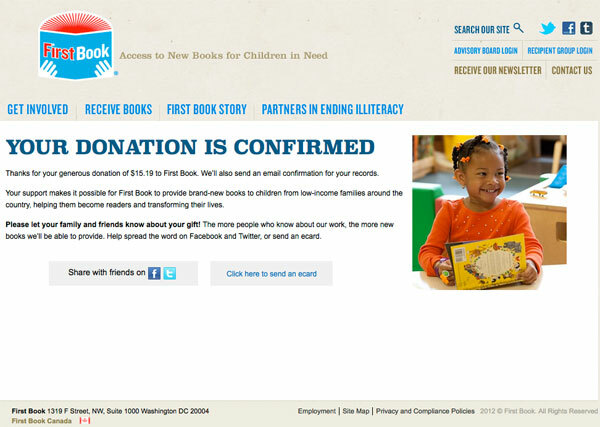 So we’ll make a donation to First Book for $15.19. Doesn’t sound like much, but it will provide six new books to kids in need. That’s pretty cool. Thanks to everyone who bought a copy! Those sales can be combined with the 36-some odd sales from our Kickstarter campaign and that’s pretty great for a self-published book written by a 6-year-old. How many books did you sell as a first grader? I’ve got a big ol’ nothing in that count. Creating this book, sharing it with the world and giving back in a tiny little way has been pretty awesome. The numbers don’t sound like much, but we weren’t in it for the numbers. More than anything I had a blast doing it with Lexi. I now owe Milo a book project of his own. And this is a great test case for how kids can make their own books (not to mention how to use Kickstarter). While we’re no longer donating our profits (we’ll now siphon the cash straight to Lexi’s college fund), you’re welcome to grab your own copy of The Stephanies. We’ve got the original paperback, a “Color-Your-Own” paperback, and digital versions for the Kindle, iBook & Nook, and the standard PDF version. It’s a great little gift for the kid in your life, no matter how old they are.